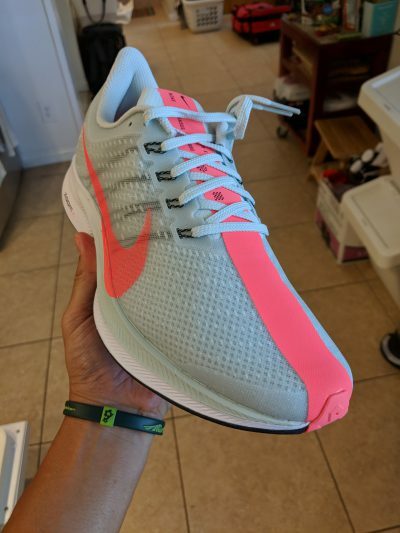 In mid-July of 2018, Nike announced the release of the Zoom Pegasus Turbo, a completely brand new model that was a unique combination of Nike's latest foam technologies and design directions. My review 300 miles later. By now most people have heard about the Nike Zoom VaporFly Elite and 4% shoes that have Nike's greatest foam technology dubbed ZoomX. According to Nike, this delivers 85% energy return while also being their lightest foam. The performance of this foam comes with the drawback of not being very durable. 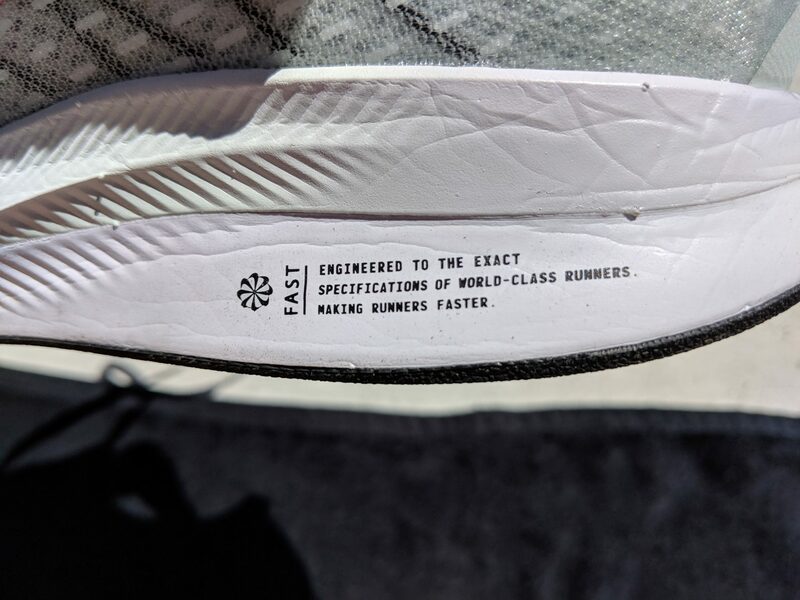 The story is that elite runners who loved the VaporFly shoes for racing wanted something with a similar feel but more suited for daily training runs. Nike took that feedback and combined a layer of ZoomX foam with a layer of their new React foam to create something new. 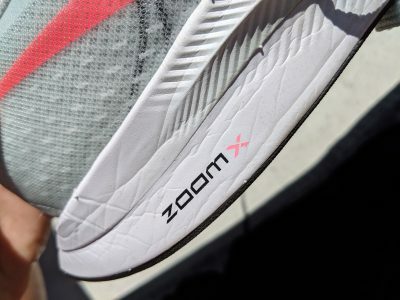 In addition to borrowing the ZoomX foam, Nike also took additional design cues from the VaporFly models and added the aerodynamic shaped heel to help improve performance. A new dual layer upper with a signature racing stripe over the toe box completes the look of the shoe to accentuate the speed of the shoe. ZoomX foam creases after the first run. 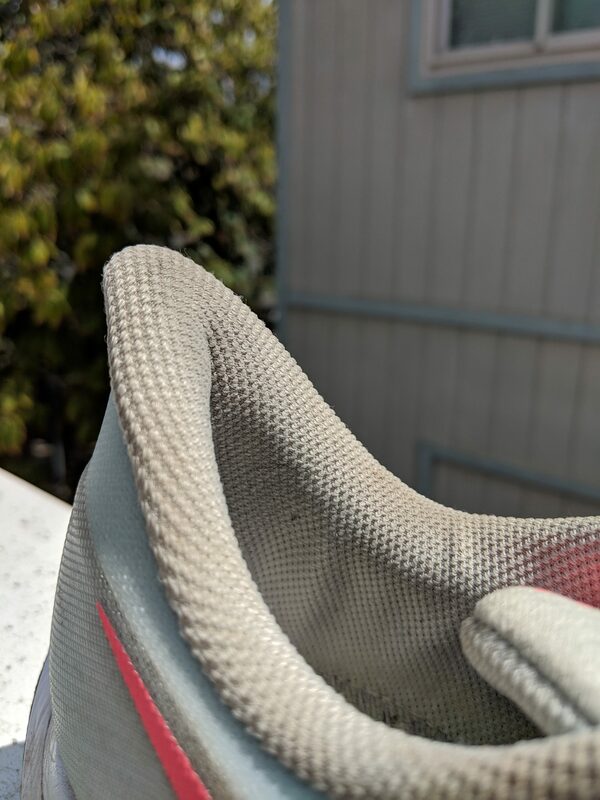 I wanted to try out ZoomX foam and I didn't want to spend $250 USD on a pair of Vaporfly 4% shoes. Of course, these shoes weren't that much cheaper with a MSRP of $180 USD. 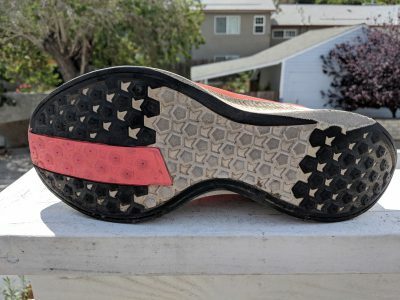 I'm basically the exact target demographic of runner who's curious about ZoomX foam and doesn't necessarily want the carbon plate feel all the time. How Have They Worked Out? First of all, despite the shoes having Pegasus in the name, they are nothing like a Pegasus in terms of feel, fit, design, or performance. 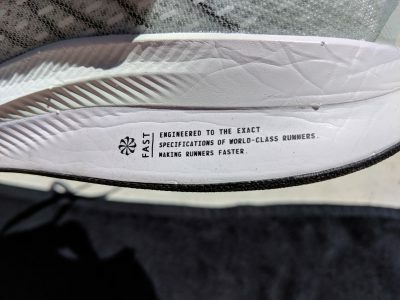 They probably should have called it a Zoom VaporTrainer or something since it literally shares nothing with the latest Pegasus 35. The only thing it has in common with the regular Pegasus is that it's a daily trainer. I put 300 miles on these shoes and used them exclusively for training which consisted of a lot of tempo runs along with recovery runs. While a majority of the runs where on the road, I did take them on some trail and rainy runs as well. The furthest distance I ran in them was 26.2 miles (42km). The initial step-in feel is one of comfort. The ZoomX definitely feels very soft to a point and then as you continue to put your full weight down you can then feel the firmer React foam giving you a slightly more responsive feel . The shoe was stable but it definitely had a squishy soft feel. This feeling was especially noticeable during the first 100 miles. Also during this time, the ZoomX portion of the foam creased markedly. 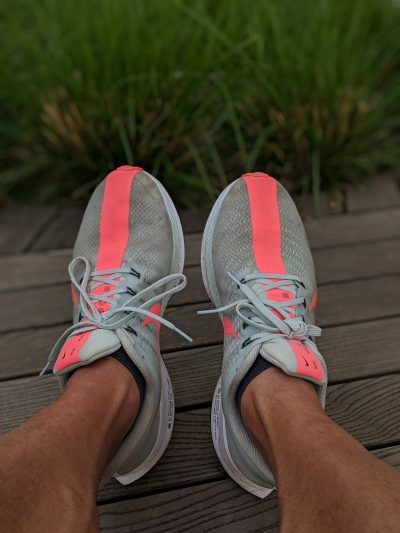 The shoes seemed to settle in the next 100 miles and I was able to run some very nice longer tempo runs where it was easy to run at a slightly faster pace than normal. The last 100 miles often felt like it was mostly just React foam and the shoe definitely lost some of it's comfort and I wore out the outsole. Some things that I liked about the shoes were the slightly wider forefoot, the new flared heel, and the gusseted tongue. The wider forefoot was surprising and allowed for slightly better toe splay (for a Nike shoe). The very well padded an flared heel was a nice design touch to keep heel/Achilles irritation to a minimum. I'm a big fan of gusseted tongues that help keep debris out and keep a tongue in place. I really did not like dual layer construction with a clear membrane over the engineered mesh beneath it. The overlay was a complete dirt trap and seemed to limit the breathability of the shoe. Honestly, while they were easy to run in, I never loved them and they were never the first pair of shoes I'd reach for. I think there are other shoes in the same category of lightweight trainers that are better deals and offer a similar level of comfort and performance. While I did force 300 miles out of them, I really feel that their light span is closer to 225-250 miles. I think Nike wanted to experiment to see if they could sell their ZoomX to a larger market and had to figure out a way to make the shoes more durable so they mixed React with ZoomX. I think the kind of succeeded although I don't see a lot of people wearing them at races or out on training runs so I think the appeal is limited. If you can find them on sale then they might be a competent daily trainer if you like a softer feel. Otherwise, I'd say your money is better spent elsewhere. 0 Comments. Be first to leave one! © 2019 www.groovc.com. all rights reserved.